Archive of posts about the technologies Lambert Instruments applies in its products. Subjects include fluorescence lifetime imaging microscopy theory, image intensifiers and image sensors. Image sensors are available in many shapes and sizes, and with different capabilities. But in this post, we will focus on one very important thing: the electronic shutter methods that are available. Most consumer cameras use a rolling shutter method. With this method, the pixels on the sensor are read sequentially. When you press the shutter button, the camera scans through all the pixels and stores the information digitally. This means that the first pixel will be read out at a different time than the last pixel. And everything that happens after the first pixel is read out will still be captured by the last pixel, and the pixels in between. Global-shutter sensors read out all pixels of the sensor simultaneously, so the entire frame represents image data that was captured at the same moment in time. This method is not subject to the same motion artifacts as the rolling-shutter method. In everyday use, you won't notice if your camera uses the rolling shutter method. Only when you're capturing an image of a fast-moving object (like a fan), you may notice some motion artifacts like deformed fan blades. In situations that require high-performance imaging, rolling shutter can severely affect your data. In such cases, it is better to use a global-shutter sensor, to ensure that your image represents the same instant in time and to prevent rolling shutter artifacts. GigE Vision is a framework for transmitting images over an Ethernet connection. It consists of protocols that define how to configure a camera and to transfer the image data. Every computer with a fast Ethernet card is compatible with the GigE Vision framework. So GigE Vision requires only an ethernet card, whereas CoaXPress and Camera Link require a framegrabber. The maximum transfer speed of a GigE Vision camera (assuming a gigabit Ethernet card in the computer) is 1000 Mb/s. The Generic Interface for Cameras (GenICam) standard aims to provide a generic programming interface for cameras and other camera-related devices. Every step in the imaging process -from configuring the camera to getting the recorded images off the camera- can be configured using GenICam. No matter what type of camera or data transfer interface you are using, if all your devices are GenICam compatible then it will be much easier for them to communicate. It is important that image quality is maintained as much as possible when using intensifiers. At the same time, light efficiency should be maximized. This can be achieved by using a fiber-optic window as the output of the first stage and as the input of the second stage. A fiber-optic window is a solid piece of glass consisting of millions of parallel glass fibers sealed together. Each fiber acts as an independent light conductor. The shape of the window can either be flat (parallel input and output faces), or concave. Fibers with a concave surface are used for distortion correction in electrostatic image inverters. Fiber-optic coupling is a permanent connection; the connection is made during the manufacture of the integrated intensified camera. A fiber-optic window transfers an image from one face to the other. If the fiber optic has a tapered form, the image is reduced or enlarged. This characteristic can be used to match it to the format of a coupled imaging component. While fiber-optic coupling between intensifiers is the standard technique, coupling to the camera can also be done by lens optics. Disadvantages of lens coupling are the greater loss in efficiency (compared to fiber optics) and the lenses are more bulky. Lens coupling offers the flexibility of easy decoupling, allowing you a choice to make camera recordings with or without the use of an intensifier. Before we can discuss each of these factors, we need to define what limiting spatial resolution means. When characterizing an imaging system, the limiting spatial resolution describes the smallest features that can be distinguished. 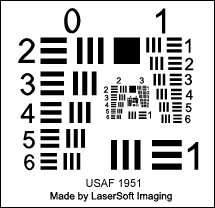 There are several ways of characterizing the spatial resolotion, most of them use a test chart like the USAF resolution test chart. Such charts have a series of lines on them, the smaller the lines an imaging system can distinguish, the better the spatial resolution. Spatial resolution is quantified in the number of line pairs that can be distinguised per millimeter (lp/mm). A line pair consists of a dark line and a bright line. So if one line is 5 microns wide, then a line pair will be 10 microns wide and there would be 1 mm/10 microns = 100 line pairs per millimeter. There is a wide range of image intensifiers available. We advise our customers on the type of intensifier they need for their application based on the wavelengths that are important for our customers, and the frame rates they need. High-speed intensifiers usually have a lower spatial resolution than image intensifiers that are optimized for lower frame rates. We can increase the MCP voltage of an image intensifier to increase its gain. But MCP noise and the size of the electron cloud at the exit of the MCP also depend on the MCP voltage, so the spatial resolution will be slightly reduced as the MCP voltage is increased. You can learn more about how an image intensifier works on our image intensifier page. Finally, the limiting spatial resolution of an imaging system is determined by the size of the pixels that collect the light from the image intensifier. You can use our intensifier-sensor matching calculator to find the theoretical maximum sensor resolution. It is calculated using the size of the pixels. For example: If the pixels are 20 microns wide, we would need two adjacent pixels to distinguish a bright line and a dark line of a test chart. Those two pixels would have a total width of 40 microns, so the theoretical spatial resolution would be 1 mm/40 microns = 25 lp/mm. The element of the imaging system with the lowest spatial resolution determines the limiting spatial resolution of the whole system. In our example, we have a sensor that has a limiting resolution of 25 lp/mm. If we have an image intensifier with a 50 lp/mm resolution, the size of the pixels would limit the resolution of the imaging system to 25 lp/mm. However, if the pixels are smaller, 2 microns for instance, then the theoretical resolution of the sensor would be 250 lp/mm. In that case, the resolution of the image intensifier would determine the resolution of the total system. Many factors influence the spatial resolution of an intensified imaging system, like the size of the image intensifier, the number of image intensifiers and the optics. If you would like more information about the right image intensifier for your application, please contact us.